Schools are meant to be a safe haven for students to get an education, not a place for guns to be kept in classrooms. Since the beginning of 2018, there have been 17 school shootings, and it’s only February. The shooting that happened in Florida on Feb 14 was just one of the many school shootings in the U.S. Between the year 2000 and 2018 there have been 91 recorded school shootings with deaths, and yet no reforms toward gun control have been put into law. How many students, teachers, faculty and officers have to perish for a change to occur in the U.S.? According to the National Home Education Research Institute, there are about 2.3 million home-educated students in the United States as of 2016, compared to the estimate of 2 million in 2010. Perhaps the rise of students homeschooled is linked to the number of school shootings. The educational system in the U.S. is currently lacking. Spending money on weapons wouldn’t do any good to the students. The funds used for guns can be used for new books, uniforms, technology for the classrooms, or new teachers. 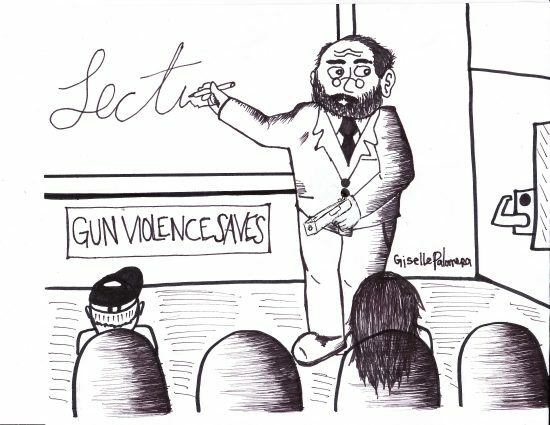 Having firearms on campus would make it easier for a shooter to attain a gun. They may threaten a teacher to obtain the weapon, or if they run out of ammo, they can simply take the pistol from the staff or faculty. “Teachers don’t need to be armed for a multitude of reasons. It will confuse staff if there is a school shooter since law enforcement won’t know who the actual shooter is,” East Los Angeles College student Zuvanny Macias said. Police officers won’t know who is truly the enemy and who is a victim. The distinction between the two will be difficult to determine. By having firearms on school grounds, it would be like a child in a candy shop; the shooter will have a variety of weapons to choose from. Teachers carrying guns will make students not feel safe at all. Teachers that decide to go through the training might just do it just to get easy cash. Some staff and faculty at school just go to work for the paycheck. They don’t care about the students. All those individuals care about is the money. When the time comes, would these individuals truly take a bullet for a student or would they hide like the trained Sheriff’s Deputy Scott Peterson on the day of the Parkland shooting in the high school? John Molina, a student at ELAC, said “The teacher can easily shoot one of the students if they are having a bad day or if they are messed up in the head. Even if they hire ex-veterans or law enforcement to be in class, some may have post-traumatic stress disorder which may trigger them. No one would know what is going through their minds, so their actions are unaccountable. Schools are educational institutions that are meant precisely for that. Students shouldn’t be afraid of getting shot accidentally by a staff or faculty because police confused the student for the shooter. The society we live in today is changing, but let this not affect the students, who are still growing and are in charge of the future. Being fearful of authority figures will bring no benefit. Creating stricter gun control laws will solve this problem. Adding guns to the place where there shouldn’t be guns isn’t solving anything.